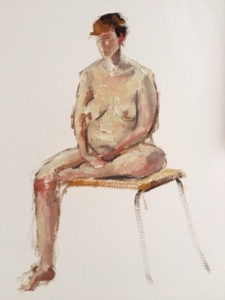 I’ve had a stab at doing some real full(ish) palette oil paintings in the life classes recently here are the results with varying degrees of looseness and accompanying turps dribbles. This one was a 1 hour study on Arches Huile paper at the Bristol Grammar Life (Ashley Down locn), size about 14 by 12 inch. 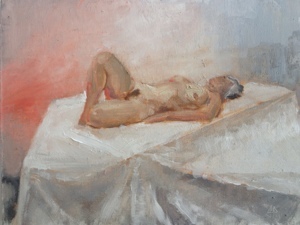 This is a two hour study on a little 8 by 6 inch board, it was at an RWA long pose day a few weekends ago. I thought I’d do a little board to warm up and ended up fiddling about painting tighter and tighter but I kept at it as I quite liked the composition. I was also using Cremnitz Lead white painting the sheets so was really having a go at being a Freud clone. This is the one I’m most pleased with I think. I like the turps dribbles so much I briefly considered switching back to watercolours! It’s on a sized piece of cardboard, 10 inch by 10 inch. Also 1 hour. P.S. 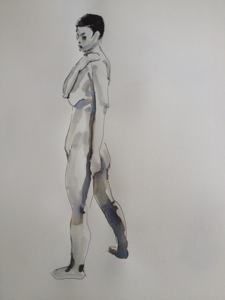 not an oil painting I know, but I enjoyed the following Quink ink study too. I was pleased with the initial outline drawing in fountain pen but took a deep breath and dived in with the watered down inky brush. 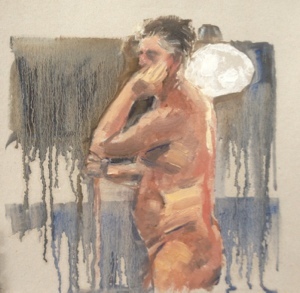 This entry was posted in recent work and tagged Life class by ianpriceart. Bookmark the permalink.